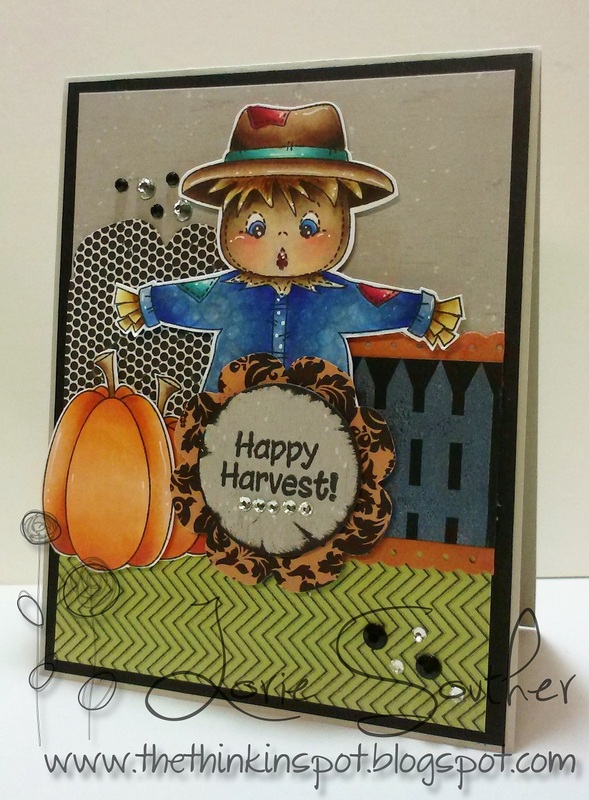 The patterned paper is from the current Peachy Picks Kit, and the scarecrow comes from this month's stamp of the month club set, PKSC-09 September 2012. 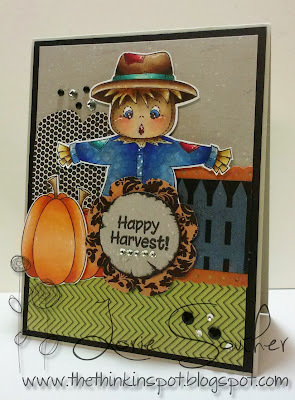 For the pumpkins, fence and sentiment, I pulled out some of my favorite stamps from last year PK-647 Faceless Fall Fun. My cute little scarecrow and pumpkins were colored with Copic Markers. Drop by The Peachy Keen Challenge Blog to see what my DT sisters have created for your inspiration, and while you're there, take notice of the BIG SALE that's going on right now at Peachy Keen Stamps! It's another Finally Friday Sale and you won't want to miss this one!!! BUY any THREE Stamp SETS and get ONE FREE! This FRIDAY!! 09-28-2012 28 HRS ONLY! Check the Peachy Keen Stamps Website for full details about how to take advantage of this sale! Have a blessed and beautiful day, and a fabulous weekend! Hope you get to do some happy stamping!!! Love it Lorie! As usual, it's beautiful!! Simply adorable! I love the scene you created. Great card! Such an interesting card, great details and as always so beautiful. What a cute card Lorie! I love it....TFS!!! Lorie, this is wonderful! So cheery and full of details, a feast for the eyes! The scarecrow is adorable and the fence and pumpkins are too cute. Great coloring also! This is my first visit and I must say I'm loving what I see! Super cute handmade card, very nice blog! Oh, Lorie! How darling! I just love that image... and your coloring! Oh, my goodness! This is just adorable. How can he be scarey with such a sweet scarecrow? A delightful part of the season. LORIE your coloring just blows me away!!! Can I pay you to give me a private lesson. You have such amazing skills with the coloring. So beautiful. Super cute card! Your coloring is so pretty and perfect:) Thanks for the inspiration. So, so, so CUTE!!! Love his face!!!. Your colouring is amazing as well Lorie!!!. Beautiful. Peachy Keen Hopping Fun Tomorrow! !